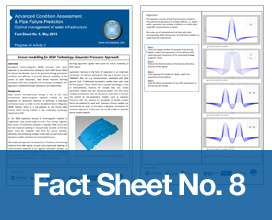 The Magnetic Flux Leakage (MFL) concept has been used in non-destructive testing for more than three decades. However, due to the presence of large parametric variations and difficulty in accurate physical modelling, data driven machine learning techniques have been in the forefront of research focus in the recent years. Most of the works are still limited to MFL based interpretation of isolated defects. As an initial study, here we propose to interpret two defects scenarios based on magnetic flux leakage. The approach is validated through simulations and experiments.